Please Note: Additional methods to enroll participants include using the Administration block and the Enroll Users CSV block. The Self Enrollment method block allows the instructor to determine the settings for which self enrollment is possible for the course. 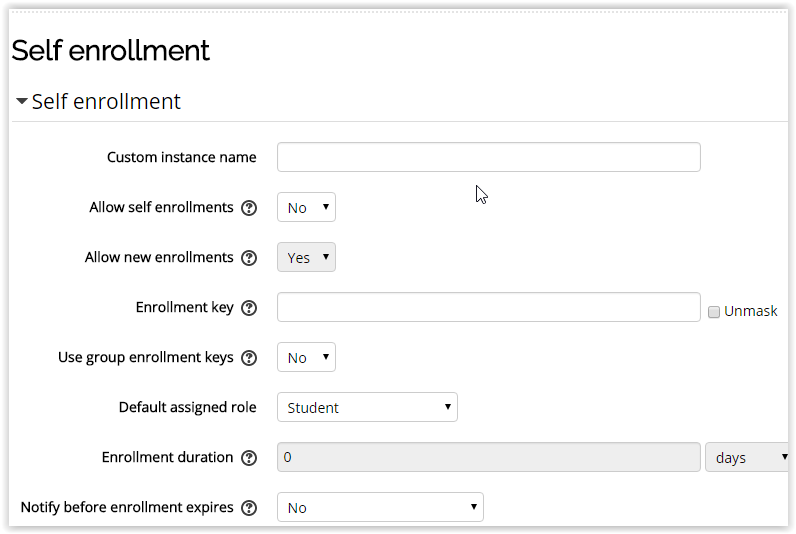 Self enrollment is the method where users can choose to enroll themselves into a course, either by clicking "enroll me in this course" or by typing in an enrollment key they have been provided. This method needs to be enabled by someone in the instructor role in the course. 2. Select the course whose enrollment methods need to be edited. 3. 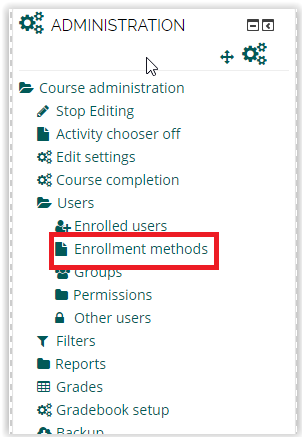 Click on Users | Enrollment methods under the Users tab in the Course Administration panel. 4. Select the Enable (eye) icon in the Self Enrollment row. 5. Select the Edit (gear) icon in the Self Enrollment row. 6. The instructor will then need to set up the various options regarding enrollments. When finished, select Save Changes. NOTE: It is recommended that faculty set an 'enrollment key' so that the users need the password in order to get access to the course.